I’m not a huge Natalie Portman fan. First, I saw her in The Professional, which was just a weird flick that was uncomfortable to watch. Then came her wretched performance (and everyone else’s… no one was blameless) in the Star Wars pre-trilogy that caused millions to shift in their seats uncomfortably from the piercing stabs of shattered expectations. Sure, I’m not without blame, as I made myself suffer through all three episodes. But I didn’t make myself watch them again, and they should have been good enough to demand that. And, for those seeking to relieve my ill will towards Ms. Portman, yes, I recognize that the pedestrian dialogue was ultimately George Lucas’ fault. That said, it’s an actor’s job to take whatever material is provided and raise it to a higher level. Damn you, Natalie Portman. 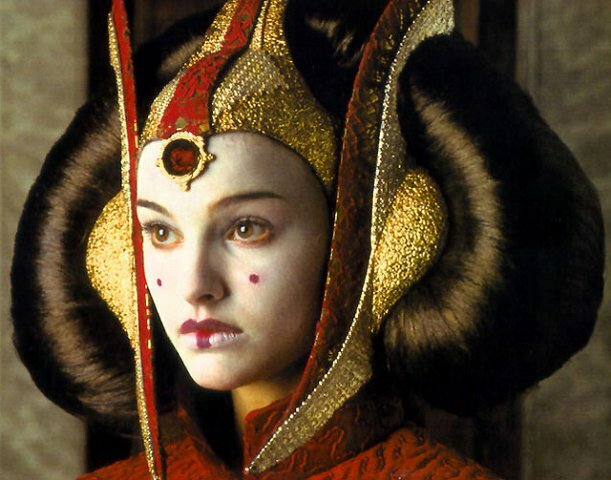 Seriously, this is the face that gave rise to the incarnation of evil throughout the known Empire? Well, yes. It is. Skip ahead to Cold Mountain and V for Vendetta and, sure, my regard for her softened. Some. But Star Wars remains not just a simple blot against movies-held-dear, but a large purplish bruise. And so what is she’s now an Oscar winner? Well, welcome to Thor. And here she goes again, changing the fate of worlds, this time by swaying the heart and psyche of a god. Gracious. First, let’s examine how the movie positions Natalie, this time not so cleverly disguised, to accomplish such a momentous feat. … and it’s not like he caused her to change the course of nations. So it must be something else. So, let’s see what the movie offers regarding Ms. Portman… Two minor vehicle/pedestrian god collisions. Possible head trauma there. … Acting the role of a scientist vs. a meat, beer and potatoes god. Again, possible head trauma. … A lot of wondering around together in the desert. Sure, it’s hot. Christ maintained his wits, so God or god, Thor has no excuse there. But, these don’t hold up. Just like Star Wars (cursed) Episodes I-III, there simply isn’t enough dialogue to support any effective change in a humbled but testosterone laden god. So few are her words that our Academy Award winner probably needed less than 15 minutes prior to the call for “Action!” to commit her dialogue to memory. So, it’s worth a moment to fathom from whence Thor emerges from spoiled brat to hero. A god (an immature, reckless and vain one, to be sure), runs off to do what’s right in his own eyes despite a parental “thou shalt not,” falls in his quest for the holy seal of approval and is dispensed to Earth (why us?) to learn, we would ultimately suppose, humility, personal sacrifice, and forethought. Well enough. That sounds like a decent “origins” story of a Marvel comics superhero, which is what this is. But more so than any other Marvel adaptations, this screenplay “reads” as if we only have the comic panels from which to gleam understanding. You can almost see the visual still from each scene in what is a very linear narrative. Writers aren’t idiots. And Thor doesn’t attract two Oscar winning actors (Anthony Hopkins is the other) if there’s not some teeth in there somewhere, right? Is it the wisdom of King Odin that molds our champion? Sadly, no. But then, we wouldn’t have a story. Is there a dark side of the Force at work? Well, not specifically, just a race of antagonists whose motivations we don’t have time to understand. Use the Force, Luke! Concentrate! Where is it? Well, not so far from Star Wars, as it turns out. Look no further than The Power of Portman! Is there a scene to suggest such terrible cause and consequence? Why, yes. A kiss! This lightning strike on the God of Thunder concludes what must have been a slow gathering of vast electric potential, because what we have here is a changed god. That Natalie. That’s not just celebrity power. It’s her. It’s a good reminder why history is important. You’d think a god, whether with a capital G or a little g, would know that. Scroll up and scroll back down. The prosecution rests. Thor’s kiss was actually the second Natalightning strike. That “more than a little peck” is being laid on one Anakin Skywalker. Cause and effect. He’s more widely recognized shortly after this exchange, clad in black and distinguishable by a singular respiratory distress.